TriMet started construction on Thursday, April 5, on its newest west side Bike & Rides. The secure bike parking facilities will be located at the Goose Hollow/SW Jefferson St MAX Station in Downtown Portland and the Beaverton Creek MAX Station in Beaverton. They will offer commuters who combine bike and transit trips an improved east-west travel experience and an alternative to bringing a bicycle onboard MAX trains. “We hope these new facilities encourage riders to park their bike on one end of their MAX trip, and use another bike, bus, employer shuttle or walk on the other end,” said Jeff Owen, TriMet’s Active Transportation Planner. MAX trains have limited space and capacity for bikes, and especially during commutes, can leave bicyclists waiting for the next train. The Goose Hollow/SW Jefferson St MAX station remains among the busiest in the TriMet system for riders boarding with bikes. It is served by both MAX Blue and Red lines. Construction of the Bike & Ride will begin on April 16, on the southeastern edge of the existing station. 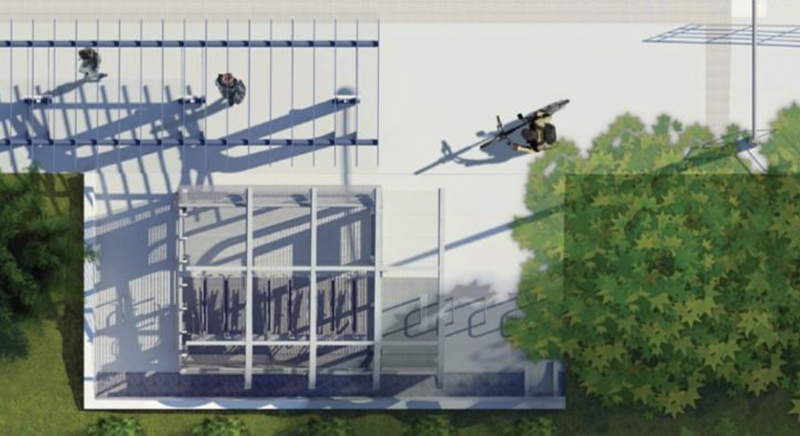 The facility will provide 30 bike parking spaces, 16 inside an enclosed area and 14 outside, within coverage of security cameras. The MAX station will remain open during construction, but auto drivers should expect some lane closures to accommodate the work zone. On Jefferson eastbound, two right turn lanes will be reduced to one. A portion of SW Jefferson around Collins Circle will also be closed. Detour signs will guide pedestrians around planned partial sidewalk closures. Construction of the Beaverton Creek Bike & Ride started April 5. Similar in style to the Goose Hollow facility, it will be located in a grassy area to the south and east of the MAX station platform. 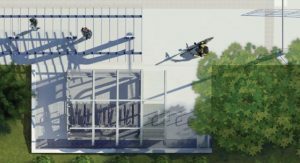 It will feature 16 indoor and 48 open bike parking spaces. The facility will complement additional improvements near the station, made to enhance access to transit by bike. TriMet recently completed a new trail crossing of the MAX tracks at Beaverton Creek. That path will eventually connect riders to future trails in the area as well as nearby employers. The Beaverton Creek station is served by the MAX Blue Line. Custom shelter facilities, constructed of galvanized steel and enclosed with stainless steel mesh and glass, will be located at each of the Bike & Rides. Described as aesthetically pleasing and functional, the shelters were designed to be replicated for future TriMet projects. Funding for the Goose Hollow and Beaverton Creek Bike & Rides is through a $1.9 million grant from the Oregon Department of Transportation’s Connect Oregon program, with additional assistance from Washington County and TriMet. Project completion is projected for the summer of 2018. TriMet is committed to making transit better. We are working to improve the overall rider experience while growing our network of buses and trains. That means increasing service frequency for less waiting at stops and less crowding on board, and adding service for more connections to jobs, school and other community services. Meanwhile, ongoing upgrades to vehicles, stations and tracks are helping to improve reliability and make the ride more comfortable.